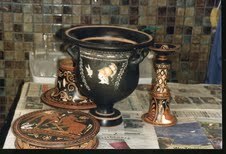 One object, an Apulian Bell Krater from 330BC that was later sold by Sotheby’s, appeared in a picture belonging to Medici that appears to have been taken in the Zurich workshop of the art restorers Fritz and Harry Bürki, a father-and-son team to whom leading antiquities dealer Robert Hecht (whose separate trial in Rome relating to the illicit trade is likely to end without a verdict because it has run out of time) sent works for restoration. The Madrid catalogue makes no mention of the krater's sale at Sotheby's. The Carabinieri are on the trail of objects that passed through the hands of Fritz Bürki (see here). Moreover some of the antiquities returned to Italy from North American collections (e.g. Boston, Cleveland, The J. Paul Getty Museum, New York, MMA) have been linked to him. Bürki not only restored objects, but he sold items directly to museums and to private collectors. It looks as if the 22 objects in Madrid will be repeating a story known from so many other locations. Gnathian krater in restauro, from the Medici Dossier.